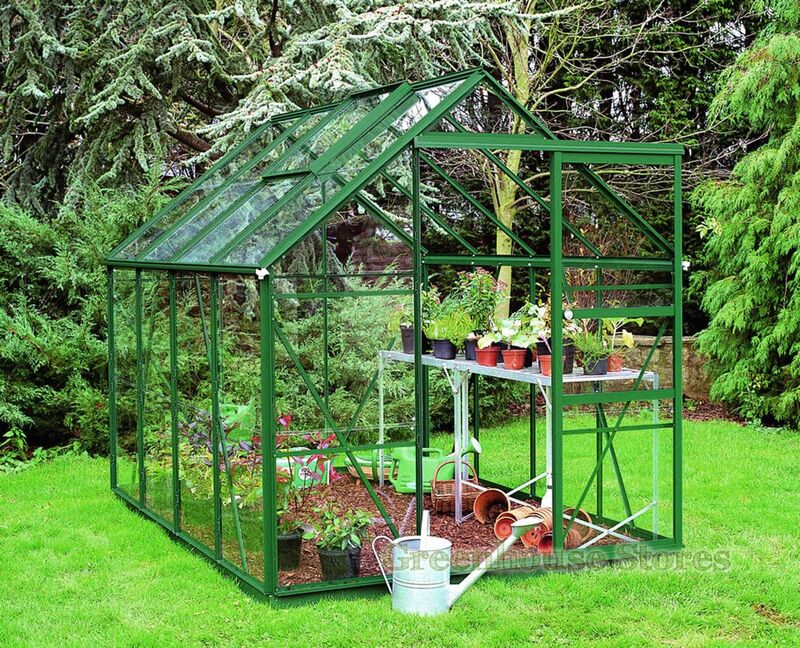 1910mm (6ft 2") Wide Aluminium Greenhouse - Compact Width. Green Powder Coated Aluminum Frame - Rust and maintenance free. Single Sliding Door - Can be fitted to slide either way. Built in Green Base Plinth - Gives great strength and rigidity. The 6ft 2" wide 8x6 Eden Regent Green Greenhouse is spacious and sturdy making it an ideal greenhouse for your garden or allotment. The Eden Regent 8ft x 6ft Greenhouse has some great features like it’s built in aluminium base plinth to keep the greenhouse stable and rigid throughout it’s life and give extra roof height. The Regent 8x6 is strengthened at the eaves and ridge and features nice high 4ft 9" eaves giving you plenty of useable space around your greenhouse for growing taller vine plants like tomatoes. The ridge of the greenhouse is 7ft 4" giving comfortable headroom for taller gardeners. This Eden Regent Green 8x6 Greenhouse with 3mm horticultural glazing has 1 opening roof vent for ventilation, a single sliding door and integral gutters to collect rainwater. The Eden Regent has been replaced by the new UK made Eden Burford.